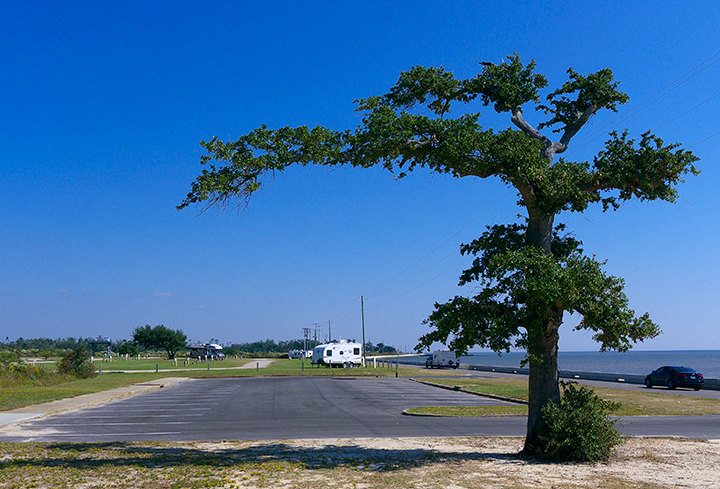 Buccaneer State Park, Waveland, Miss. 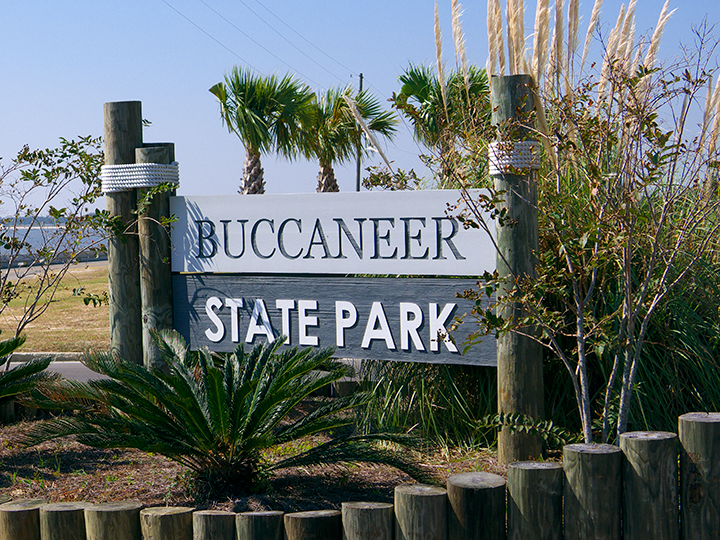 Buccaneer State Park is southwest of Waveland, Miss., and is right on the Gulf of Mexico. Watch for the sign along Beach Blvd. 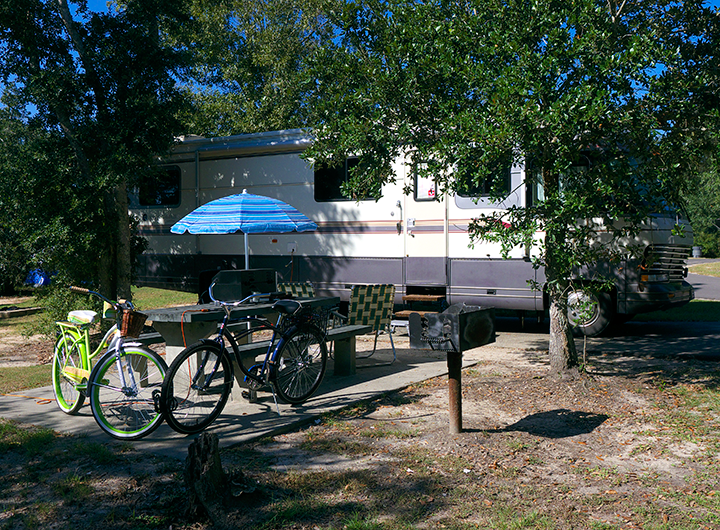 The park has 70 waterfront w/e campsites. Hurricane Katrina destroyed the park and after a long reconstruction it reopened in November 2013. 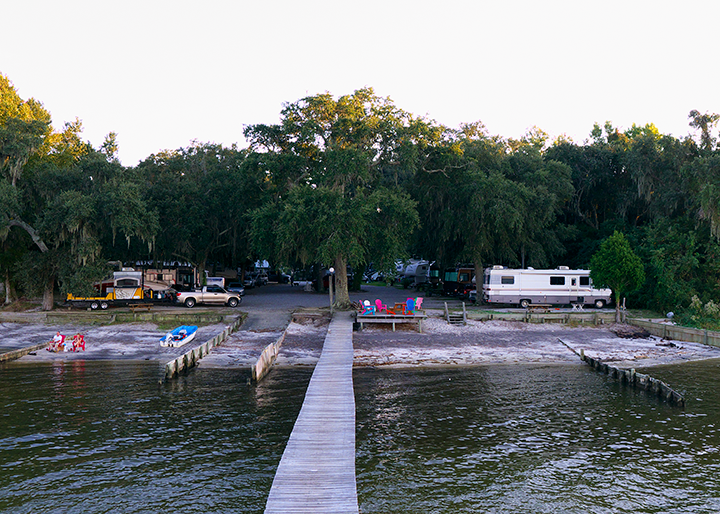 In addition to the 70 waterfront campsites it also has 206 FHU sites complete with trash pickup, waterpark, store, big wading pool and day-use picnic areas. The only thing missing is wifi. There’s not much shade in the park due to Katrina. 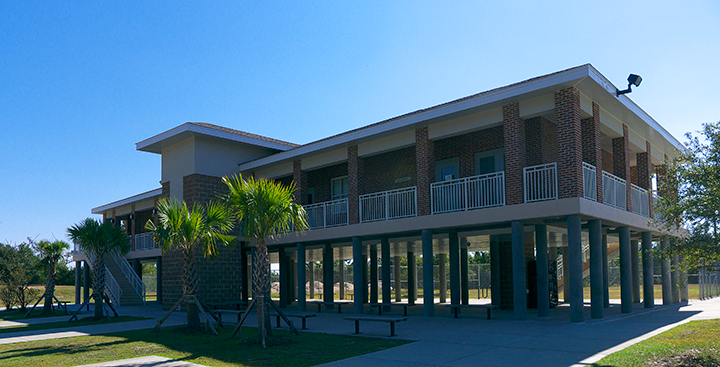 The store and laundry facility is built to withstand another hurricane, as are all the other buildings in the park. 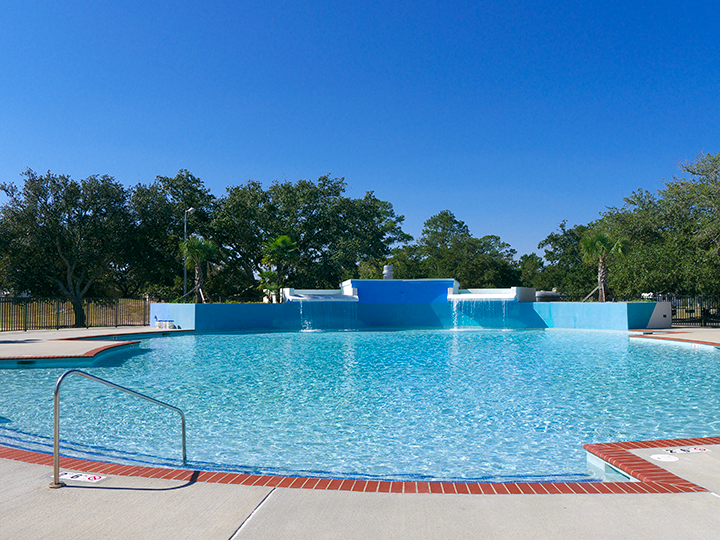 The pool is three and a half feet deep and would be nice to float around in summertime. The Barge backed into our campsite. Although our campsite was described as a 51-foot site the paved pad stopped about 36 feet from the roadway with a steep dropoff behind. No problem for us but it might be for a longer rig. Also there’s an active railroad track along the north end of the park. WARNING – The railroad grade crossing on Clermont Rd. approaching the park has been built up and a longer or lower rig than ours may bottom out; there’s a warning sign on that road. The crossing on Lakeshore Rd. is level. 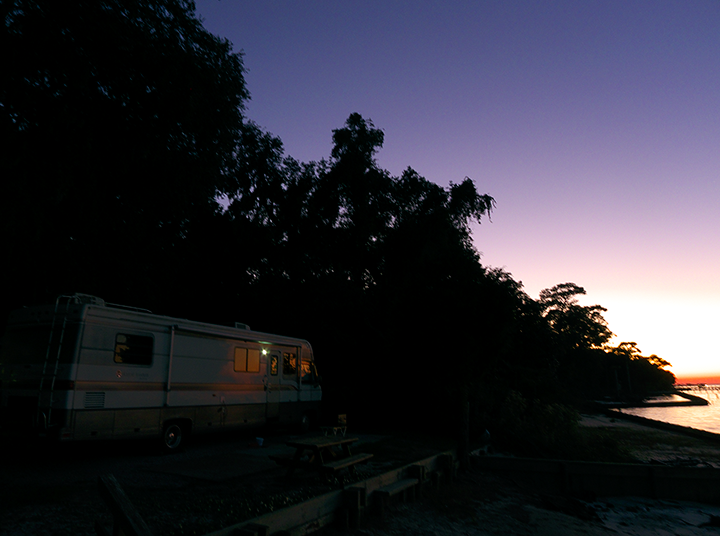 Bay Breeze RV on the Bay, Gulf Shores, Ala.
Bay Breeze RV on the Bay is one of only two RV parks right on the eastern shore of south Mobile Bay and the view is wonderful. 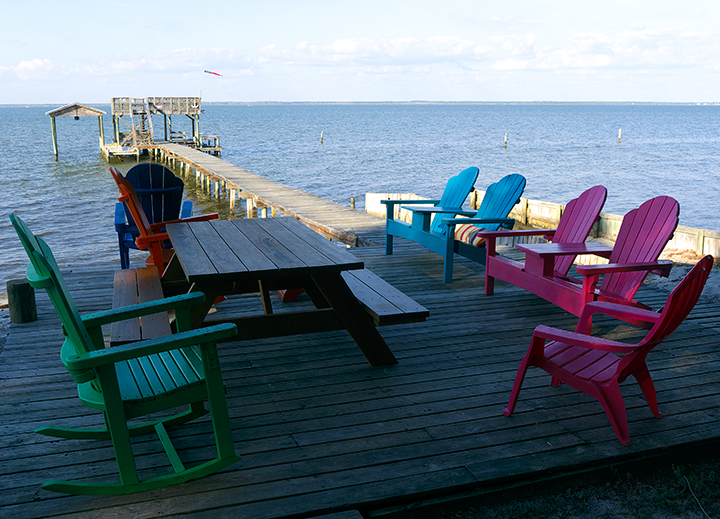 Pull up a chair and set a spell. Most of the FHU sites have a least a view of the bay and two are waterfront and all have a concrete patio and a picnic table.There’s plenty of shade but that means your satellite tv may not work; our portable dish worked more-or-less at the very corner of site 11. Also available is a bathhouse and laundry room and free wi-fi that works well. 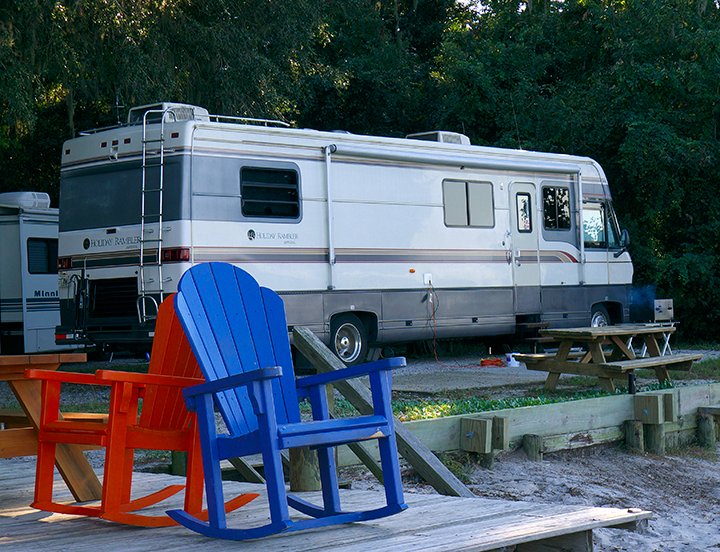 The Barge is snugged into campsite 11, one of two waterfront campsites. Bay Breeze is a small park with only 25 sites. Everyone was very friendly and spotters spring into action the help campers get into or out of the back-in sites. Payment is by cash or check, and no refunds are given for cancellation; a credit is given. 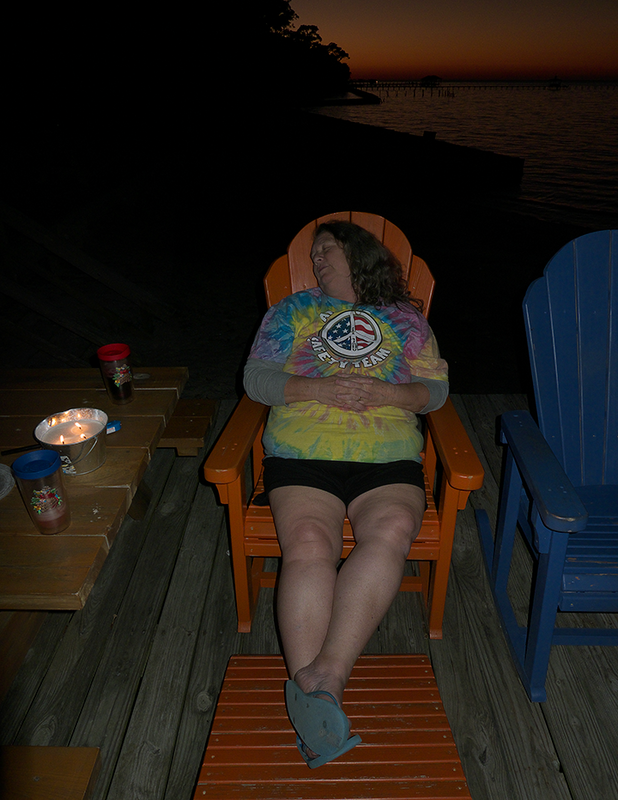 Mom takes a little break from being lazy. Bay Breeze is about six and a half miles down West Fort Morgan Road (Hwy 180). Look for the sign and the flags. We got a new super-spiffy foldable bike rack to fit the bikes we don’t yet have. One problem; it has a rise that hangs up on our bumper. Problem solver that I am, I ordered up a receiver extension from Amazon. Unfortunately the raised end hangs up on our bumper. Today I went to two Walmarts, a Home Depot, a Lowe’s, Pep Boys, Advance Auto Parts, Ace Hardware, a truck accessories shop and an RV shop. No longer extension to be had. Since the rental car was due back an hour ago I had to give up. But I don’t give up for long! A bit of judicious prying and tugging and percussion adjustment and Bob’s yer Uncle it was in. I somehow didn’t crack the 21-year-old fiberglass bumper and if we ever want to get it out we’ll have to chain it to a tree and drive away, but the bike rack is INSTALLED thank you very much.